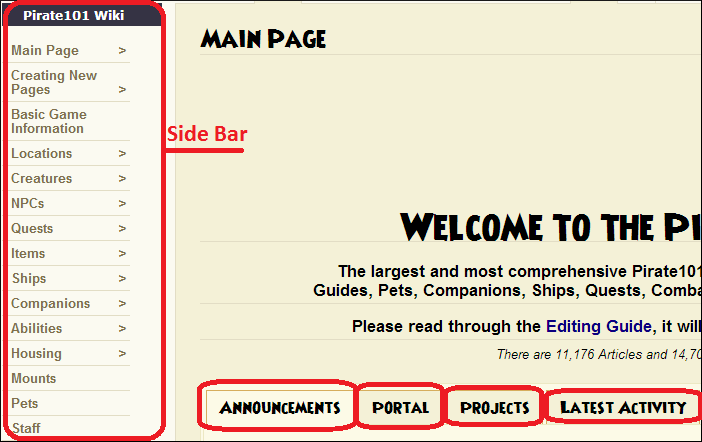 The Pirate101 Wiki is a Central Website created as a place to gather all information on the Pirate101 Game ranging from basic Item pages to the breakdown of each companion's stats by level. 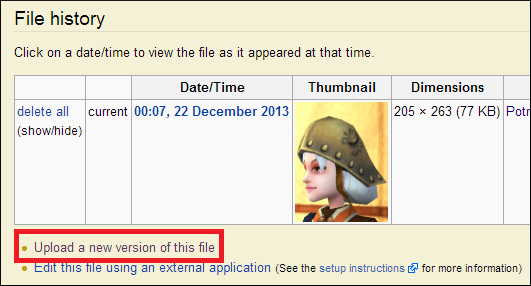 The Wiki is able to edited by any individual who has a Pirate101 Central Account and is properly signed in. This guide is meant to explain the basics of using the Wiki. 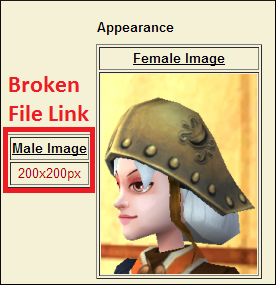 The Wiki is all based on the contributions of the community, to grow we need help from all players willing to add to the ever-growing Pirate101 Wiki. If you have any questions after reading this guide do not hesitate to ask! The Wiki itself is very easy to get to. 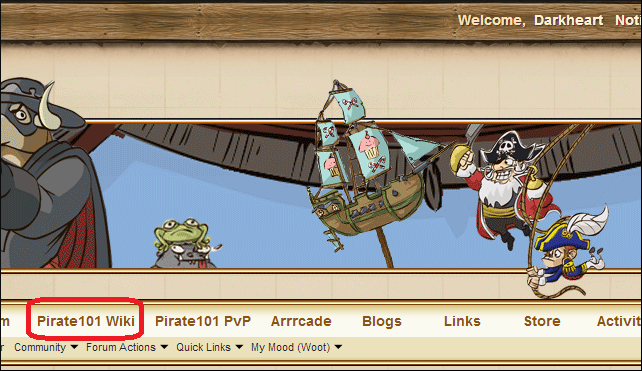 Under the Site headers you can find a direct link to the Main Page of the Wiki as a tab between "Forum" and "Pirate101 PvP." 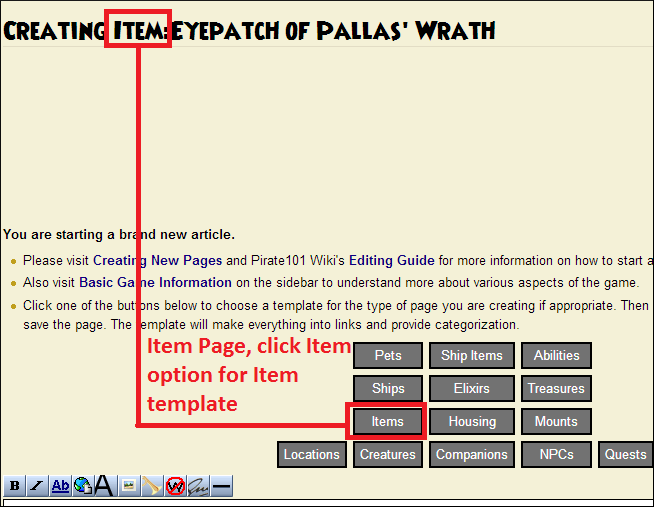 You may also type www.pirate101central.com/wiki into your address bar and you will be taken directly to the Main Page. While you don't need to be logged in to view the Wiki, you will need to be logged into your central account to edit the wiki. Your Pirate101 Wiki account and Pirate101 Central account are linked and will both contain the same Username and Password. The issue many members will run into is that they will be constantly logging into the Wiki. In order to remained logged in on the Wiki, log out of your account on Pirate101 Central, go to the Wiki, and log back into your account through the Wiki. You will be logged onto Pirate101 Central as well. On the Main Page of the Wiki you will see four different tabs and additional resources to be used on the Wiki. The Announcements tab will provide recent updates both in game and within the site itself. The Portal tab provides links to basic information on the numerous aspects of the game and pages within the wiki. The Projects tab will outline projects currently running and Latest Activity will show the most recent updates to the Wiki. On every page you will see a Sidebar to the left of your screen, this is a great tool in traveling around the site. Whenever you wish to make a change to a page or have information missing from a page that you wish to add to it, click the "Edit" option at the top of the page you want to edit. Some pages may state not to edit them, and some even don't even have the option to edit and instead have a "View Source" option. Pages with the "View Source" option are Protected, which means only Wiki Masters are able to make changes to that page. View Source will also show if you are not logged into your account for all pages. Once you click the "Edit" option you will be taken to Edit Interface for that page. Add to the page as needed, use the Template Instructions located near the bottom of the page for information on what each parameter means. It is suggested that before you save your changes that you use the "Show Preview" or "Show Changes" option to make sure there are no discrepancies or errors in your edit. If you would like to leave a comment regarding your edit you can enter it under "Summary" which is located right above the Save/Show Preview options. Keep in mind that the Wiki only accepts live realm content. Test realm content always faces the possibility of changing over time so it is requested that no test realm information be added to the Wiki. Any information added to the Wiki must be factual and not contain any rumors, opinions, spoilers, or irrelevant information. Information must be first hand as well; guesses or speculations are not viable sources. Second hand sources such as screenshots are accepted. Also remember that vandalism and inappropriate content of any kind is not allowed or tolerated and may lead to suspension of Wiki Rights or sanctions on your account. 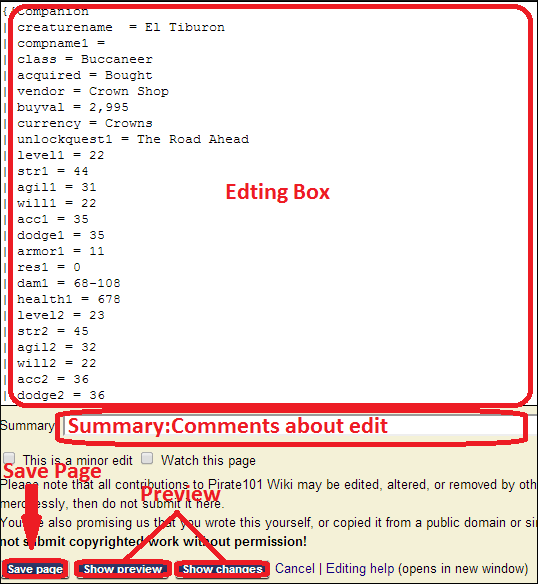 Pages within the Wiki are named in various ways dependent on the type of page and it's condition in game. Pages that in most cases require more than just the name of the object in game are listed below. Companions:All Companion pages (except Crown Shop Companions) will be titled with the companion name followed by the companion type in parentheses. 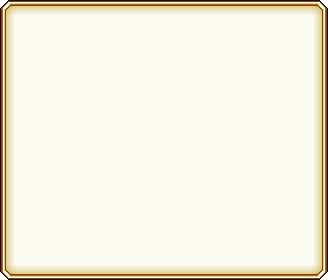 Crown Shop companions will just have "Crown Shop" added to the beginning of the page name. If the companion name is different for every player than the page will just be titled with the companion type(and with the Crown Shop prefix if it comes from the Crown Shop). Abilities:If an ability has multiple ranks than the page of the ability will be named with the ability name followed by its rank in parentheses. There are 2 different ways to create new pages. You can either use a red(broken) link on page that has already been created or use the "Create a New Page" link on the Main Page and in the Sidebar. 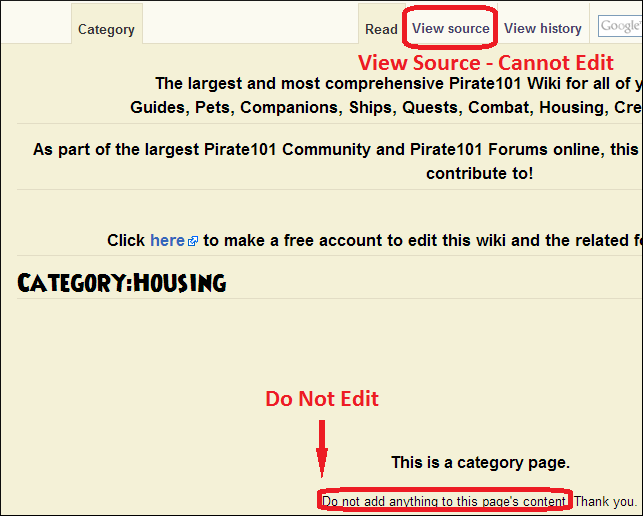 On the Main Page under "Pirate101 Wiki Needs You!" and in the Sidebar there is a link to Create a New Page. You will be taken to a Page Creation form where you will be able to choose the type of page you wish to make. Currently this includes Locations, Creatures, NPCs, Quests, Items, Housing Items, Mounts, Elixirs, Pets, Abilities, Companions, Ship Items, Enemy Ships, Ship NPCs, Henchmen. Depending on what type of page you want, type the page name into the proper field and click the create button. 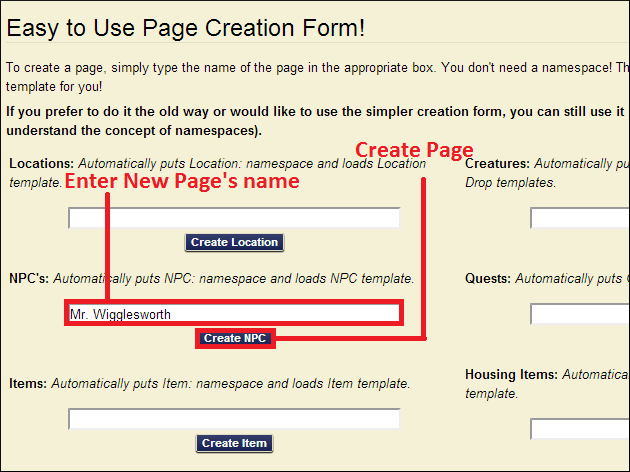 As an example if you were going to create the NPC "Mr. Wigglesworth" your would enter that under the "NPCs" field and click "Create NPC." 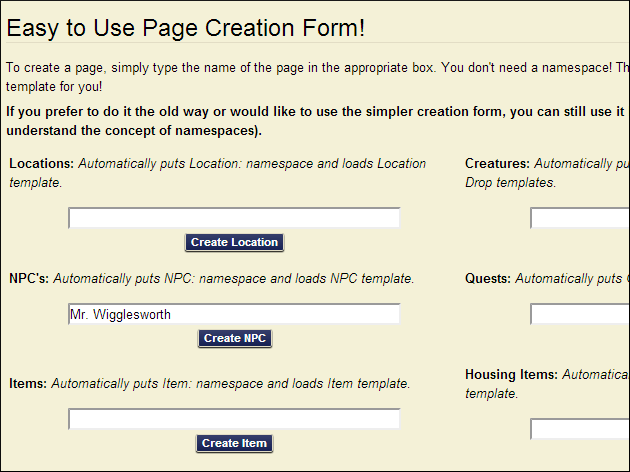 This will automatically fill in the correct template and add the proper namespace to the page name. If you create a page through a red link, you will be taken to a form where you can create the page for the red link. The pagename will already be set, you will just need to choose the correct template from the list of grey boxes and fill out the template. There are two ways to upload images, through the toolbox and through red/broken links on pages. 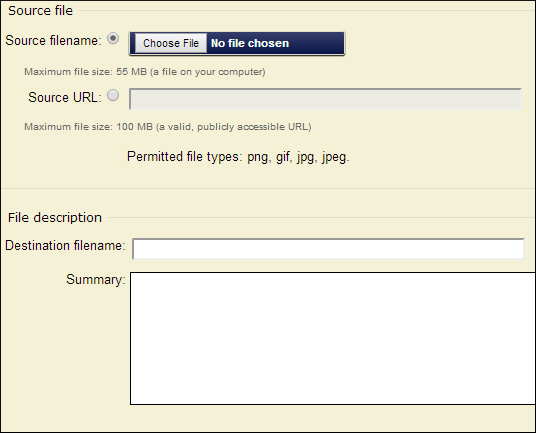 Click on the "Upload File" link in the toolbox and you will be taken to a form to upload your file. In the final field, under "summary," you must correctly categorize the file. This can be done by typing "[[Category:Category Name]]" For the Purple Koi-Fish "[[Category:Pet Images]]" would be typed into the Summary field. Image Categories to be used are covered below. You may also upload an image by clicking the red/broken links where a file belongs on a page. The Destination Filename will automatically be filled out for you, you will just need to enter the image category and choose the correct file to upload. Every member may upload a new version of an image if they feel the image needs updating or a better version of itself. If you want to upload a new version of an image, go to the file's page, and click the "Upload New Version of this File" option. You will be taken to the same form as above and the Destination Filename will already be filled out. Fill out the reason for the new upload if you wish, choose the correct file, and upload. As stated before, whenever you upload an image you will be required to categorize the file. Below is a list of categories to use dependent on type. Throughout the Wiki you may notice blue or red words within pages. These are links to other pages, blue ones linking to existing pages, and red links linking either to the wrong page or a page that has yet to be created. They are several ways to link to pages. To make a link to a page that is not plural, plural, merely add an "s" after the link. Another example would be if you wanted to link to Creature:English Bill, but needed to be displayed as "Bill"
You may find that you need to link to another category while editing the Wiki. Using either link in 8.1 or 8.2 would categorize the page rather than insert itself as a link. Because of that if you wish to link to a category you must insert a colon before the Category Namespace. Throughout the Wiki you may find "Flags" at the top of pages. There are various flags that usually indicate missing, incomplete, or incorrect information. There are several other guides on the Wiki at your disposal for your use. Some go into more detail on subjects in this guide while others offer further information not included in this guide. If you have any questions, or have a suggestion for the guide or additions to the guide, please don't hesitate to post! Last edited by Darkheart; 03-23-2015 at 11:19 PM. Thanks for the very helpful guide to the wiki Darkheart. Thanks for the guide i didn't know that about the pictures and congrats on becoming a wiki master! Check out my musketeer guide to gear setup companions and power setup here. The wiki makes a lot more sense to me now. Thanks! Copyright ©2012-2018, Pirate101 Central - All Rights Reserved - Portions Copyright ©2012-2018, KingsIsle Entertainment, Inc. Content published on Pirate101 Central requires permission for reprint anywhere.